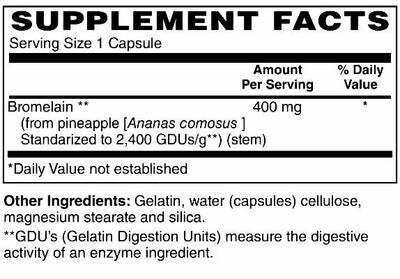 Bromelain is a digestive enzyme found in the pineapple. It can aid in digestion, as well as decrease inflammation when taken properly. How does Bromelain support health? On an empty stomach, Bromelain gets transported through the blood stream to all areas of the body and acts as an anti-inflammatory, thereby reducing pain. When taken with food, Bromelain helps to digest food for better absorption.